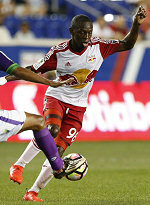 The New York Red Bulls defeated Antigua Guatemala FC on Wednesday night at Red Bull Arena in the first match of Group F in the CONCACAF Champions League. New York benefited from an own goal in the 16th minute, while Alex Muyl and Sacha Kljestan added goals in the second half to secure the victory. Muyl had a hand in the first two goals, as he launched the original shot that deflected in off of a defender for the first goal. In the second half, Muyl was able to corral a hard, low cross from Kemar Lawrence in the box, make space for himself and fire a shot into the open goal. Sacha Kljestan entered the game in the 78th minute and scored almost immediately on a quick give-and-go with Gonzalo Veron. Kljestan now has seven goals on the season and has scored in MLS, U.S. Open Cup and CONCACAF Champions League. Antigua GFC played with 10 men for roughly 64 minutes after Sixto Betancourt was given a straight red in the first half of play. Ryan Meara earned the start in goal and earned the clean sheet. The Red Bulls saw five Homegrown players see time together for the first time in the second half en route to the convincing victory. Lineup: Meara, Lawrence, Collin, Perrinelle, Duvall, Adams, Davis, Martins, Muyl, Wright-Phillips, Veron. Subs: Lade, Etienne, Kljestan.